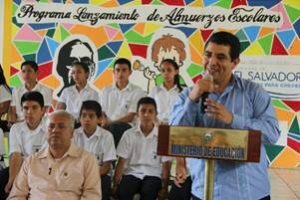 COAR’s School was chosen by the Salvadoran Ministry of Education as the launching point for the government’s new initiative to combat child delinquency, gang recruitment and hunger. Throughout the third world, 7th, 8th and 9th graders attend school for 5 hours each day – usually in the morning starting at 7am. But, at noon, they often head home for lunch with their families and rarely take advantage of the many extra curricular programs that have been created to make academics fun and keep the kids safe and focused on learning and development. Once the children are off school property, they are immediate targets for gang recruitment and violence. Additionally, those children born into extreme poverty may simply not have a healthy balanced meal waiting for them at home. This July, the Vice President of El Salvador came to COAR’s school to unveil a new national Free Lunch program targeting kids in 7th-9th grades and high school. This program is part of the national School Food program that provides meals to over 1.2 million children across El Salvador. The current “free breakfast” programs only offer a nutritious meal to children in K-6th grades. While providing nutritious lunches to children is a remarkable commitment in its own right, the true benefit to this program is its secondary goal of keeping junior high and high school students on campus and involved in the fabulous extracurricular programs that have been developed in recent years. These programs include workshops in entrepreneurship, sustainable farming, art & music, clothing and jewelry design, baking and cooking classes and academic tutoring programs. Keeping the kids engaged in academics or skill development programs and away from the gangs is the greatest benefit to this program. COAR has been blessed once again to serve as the launching point for Salvadoran government programs. Ideally, the government hopes that the graduates of the entrepreneurship workshops could one day form micro-businesses that supply the food to the schools as part of this program. This program is primarily funded by an Italian Educational grant, the World Bank, and USAID. The Ministry of Education’s press release that was distributed nationwide ended with this quote “The official launch of the government’s School Lunch Program took place at the Complejo Educativo Catolico COAR in Zaragoza, La Libertad. The school currently educates 914 students from pre-K through high school. There are 39 teachers on staff serving an extended school day (morning and afternoon sessions) that provide extra curricular programs in baking & cooking, clothing & jewelry design, sustainable farming, arts, sports and music programs.